The Republic of Fiji, which includes the island of Rotuma, lies wholly within the southern tropics, between the Equator and the Tropic of Capricorn, and between longitudes 175 and 178 degrees west and latitudes 15 and 22 degrees south. The area included within Fiji’s Exclusive Economic Zone (EEZ) is 1,163,272 square kilometres but most of this is ocean with only 18,333 square kilometres of land. Only 16% of this landmass is suitable for agriculture and is found mainly along the coastal plains, river deltas, and valleys. The estimated number of islands that make up the Fiji Group varies from 300 to 500, depending upon who is doing the estimation and whether small rocky islands and sand cays are to be classed as individual islands. In fact, there are over 300 islands of an area of 1 square mile and over (2.6 square kilometres), no more than 100 of these are permanently inhabited, although many more are visited periodically by native owners to fish or to gather coconuts. The majority of the total population of 775,077 people (as at 25 August 1996) live in the two main islands of Viti Levu (10,429 sq. km) and Vanua Levu (5,556 sq. km) which have mountainous interiors - over 900 metres above sea level. Around 60% of the population live in rural areas. The combination of the prevailing south-easterly trade winds and these mountain ranges result in a distinct dry western climate suited for sugar cane and a similar distinctive wet and humid eastern climate which Suva, the capital city suffers from. Other main islands are Taveuni (470 sq. km), Kadavu (411 sq. km), Gau (140 sq. km) and Koro (104 sq. km). The other city is Lautoka. Most authorities agree that the indigenous Fijians came into the Pacific from Southeast Asia via Indonesia. The first discovery of Fiji was by Abel Tasman in 1643, then Captain James Cook sailed through in 1774 and made further explorations in the 18th Century. Then Captain William Bligh sailed through on the Bounty in 1789. However, the first Europeans to land and live among the Fijians were shipwrecked sailors and runaway convicts from the Australian penal settlements. Then came the Sandlewood traders and missionaries in the mid 19th century. The signing of the Deed of Cession in 1874 made Fiji a British Crown territory until 1987, following the two coup d’etats that made Fiji a Republic. The Constitution is the supreme law of Fiji. The Constitution Amendment Act 1997, to amend the 1990 Constitution came into operation on July 25, 1998. In principle, the new Constitution gave regard to recognizing, respecting and upholding the rights and interests of all ethnic groups in the country. The passing of the new Constitution led to Fiji’s re-admission to the Commonwealth in October 1997, restoring some of the links with the Crown. Authority is vested in the President who is appointed by the Bose Levu Vakaturaga or Great Council of Chiefs. The President serves for a five year term. One of the President’s responsibilities is to appoint the 32 Senators. Fiji’s Parliament largely follows the procedures and customs of the British where there is an elected House of Representatives (71 members) and a nominated Senate. The Cabinet is made up of the Prime Minister and other Ministers. Ministers are chosen from elected members of Parliament who form the Cabinet. Government policies are formed by this Cabinet with assistances from special sub-committees. Cabinet decisions are carried into effect by individual ministers. In 1875, the very first Department of Lands and Immigration was established and at the same time, a Survey Office was setup and headed by a Surveyor-General. One of the Surveyor General’s first duties was to issue licences to survey land. No surveys of land carried out by persons other than licensed surveyors would be recognized by any Court or the Registrar of Titles. In 1876, the Real Property Ordinance was enacted and came into force a year later. This is the principal act which has dictated the survey profession in Fiji and was based on the famous Torrens Systems of land registration. The Ordinance also ensured that all lands registered under the Ordinance were properly surveyed to the satisfaction of the administering Government and that all survey plans should be properly charted on standard cadastral map sheets. What were undoubtedly the two most momentous occurrences in the history of surveying in Fiji took place between 1905 to 1939. It was found most unwise to continue on surveying lands in independent parcels with only flimsy connections between each other. It was very difficult to ‘fit’ surveys together. A comprehensive framework of accurately surveyed points to which all surveys of boundaries could be connected was considered an urgent necessity. By the end of October 1908, a team from the United Kingdom under the leadership of Captain Lee assembled in Suva to carryout the principal triangulation of the main island – Viti Levu. Captain Lee was succeeded shortly by Mr G. T. McCaw. This important task of establishing a Triangulation network for Fiji was completed by the end of 1915 but it was not until 1917 when the Report was finally published. Until this day, the so-called ‘McCaw Survey’ of Fiji is universally regarded as a ‘classic’. Not only has it proved of immeasurable value in the control of boundary surveys, but also of great value to all hydrographic surveyors who have worked in Fiji waters. The Director of Lands and Surveyor General is responsible for all land surveying activities in Fiji, including the development and maintenance of Acts, Regulations, Notices to Surveyors, etc. Both government and private surveyors play important roles in the survey of land and their respective roles have become more distinct in recent days partly because of the definition of the categories of land types in Fiji. Government surveyors carryout only State land surveys and government occupation in native land which means all public lands of Fiji including foreshores and soil under waters of Fiji and all lands which have been acquired by the government for any public purposes. Government is also responsible for main control survey, extension of existing trigonometrical control points. Furthermore, government surveyors carryout investigation surveys where it becomes essential to intervene in boundary disputes. Government is also charged with the duty of inspecting the work both of private and government surveyors from time to time so that standards of accuracy are maintained. In the engineering survey field, government surveyors’ carryout engineering surveys for the development of State lands only. As for as hydrographic survey is concerned, government surveyors are only involved in the provision of controls. Private surveyors on the other hand mostly carryout cadastral surveys of private freeholds and native lands. The survey of freehold land is normally done for registration in line with the Land Transfer Act, of sale of a parcel upon subdivision. The surveys of native land are done on behalf of the native Land Trust Board (the authority for administering native land on behalf of native Fijians) for the purpose of granting of registered native leases. Government may also, where it becomes more economical to do so, issue instructions to private surveyors to survey State land. The Surveyors Registration Board (SRB) was constituted under the provisions of the Surveyors Act of Fiji (No. 24 of 1969) which came into force on January 1, 1970. Under the Act, the Board is responsible for the training, education and registration of Surveyors in Fiji; the regulation of the profession; and providing advice to the Minister on all matters relating to all land surveys in Fiji. (b) Four (4) others appointed by the Minister, one of whom is from the Government service, and who is also appointed as the Registrar and Secretary of the Board. There are currently seventy one (71) surveyors listed in the SRB Register, twenty two (22) of them are in Government service, twenty six (26) in the private sector and one (1) in a Statutory body. A total of forty nine (49) are practicing, whilst twenty two (22) are non-practicing locally registered surveyors, most of whom are residing in overseas countries like Australia, NZ and Canada. Whilst not a regulatory body, FIS does set professional standards and has established a scale of fees. FIS now comprises of around 45 members; including Technical members, Associates and Student members. The Institute holds regular meetings, workshops and an annual congress. It works closely with the Surveyor General regarding survey standards and survey education. The Institute is a member of the International Federation of Surveyors. Established by Cabinet Decision with the responsibilities of making decisions, providing policies and standards and procedures in the development of GIS/LIS and remote sensing in Fiji. The major project under its umbrella is the Fiji land information System programme. Members of the FLIC included most senior civil servants and General Managers of the Native Land Trust Board and also Telecom Fiji. One of its major tasks is to maintain and promote cooperation and coordination at all levels of operations between stakeholders, in particular government agencies. This is critical in ensuring a common understanding in the data exchange and data sharing processes. Other issues of concern include human resources development and budget allocation. The Surveyor’s Act (Cap 260) of Fiji and subsidiary Regulations contain guidelines for registration of cadastral surveyors and the practice of cadastral surveying. The Surveyors Registration Board is responsible for surveyor's registration in Fiji in accordance with the Surveyors Act (Cap 260). Any person, who satisfies the Board that he is of good character and reputation shall be entitled to be registered as a surveyor in Fiji, provided he possesses appropriate qualifications and experience as may be acceptable to the Board. An annual registration fee of $50.00 is levied accordingly. The minimum qualification is a university degree in surveying. Candidates are also required to do five (5) survey projects after attaining degrees in surveying as part of the gaining experience process. Plans, calculations sheets, reports, field sheets and other necessary documents are to be submitted to the Board for consideration and vetting before the Board approves the registration of a candidate as a surveyor. A cadet survey training system to recruit new surveyors was in place since the 1950s, and had produced competent surveyors. Most of surveyors in Fiji today are the product of this cadet system. The cadet system was however abandoned in the 1980s because of the rapid changes and developments in the surveying industry, as this system was not equipped to sustain the modern and growing technology, which was changing at a very rapid rate. While the rest of the world takes survey education and Continuing Professional Education (CPD) for granted, surveyors in Fiji struggle to maintain their standards and the lack of an education system makes matters worse. Survey education is not offered at the University of the South Pacific, or at any other tertiary institutions in Fiji. New survey intakes, therefore, have to be sent to universities abroad (Australia and NZ) for training with the view to attaining degrees in surveying. The cost of sending them to universities abroad was a major constraint, and added to that is the problem of graduates leaving the country for greener pastures overseas. The Department of Lands and Survey in collaboration with FIS has now decided to set up a training programme and/or re-activate the old cadet system but modified to accommodate the ever-changing modern day survey technology and methodologies. Resources and personnel are to be sourced both locally and from abroad. Any assistance in this area would indeed be very welcome. Endless boundary disputes with associated problems were very common when trying to locate boundaries of leases. This was the result of issuing leases of an area less than 10 acres on native land without proper survey. In late 1910, the Native Land Ordinance was amended to further protect the interest of lease holders. It was therefore required that all leases and other titles that would be registered in the Real Property Register had to be properly surveyed. For the first time, Regulations governing the survey of lands to be registered in the Real Property Register were enacted. As in other countries in the region, the cadastral system in Fiji was historically designed for the transfer of land ownership in the legal land market. It also supports the legal land ownership of land and the definition of boundaries. All approved survey plans are charted on cadastral maps to indicate the location and size of properties in relation to tenure of land. Ownership details of each lot are added to complete presentation on cadastral maps. The cadastral system therefore plays a more fundamental role in the administration of land in Fiji and it is regarded as the core spatial data set in spatial data infrastructure (SDI). I am glad to report here that all cadastral sheets of Fiji have been converted to digital form and also polygonised. With the introduction of Geographic Information System (GIS), the cadastral data set has a multi-purpose role supporting many more activities such as land valuation, land management and planning, land development, local government administration, utilities management, emergency/disaster management, asset management, and other applications. There are three types of land in Fiji namely, Native, State and Freehold lands. Native land is administered by the Native Land Trust Board (NLTB), State land is administered by the Department of Lands and Surveys, and Freehold land is looked after by the Ministry of Justice. However, land registration is all done by the Registrar of Titles with the Ministry of Justice. On the other hand, any changes in Native land ownership boundaries are dealt with by the Native Land and Fisheries Commission (NLFC) of the Ministry of Fijian Affairs. The cadastre and the Native Land Commission (NLC) maps are the responsibility of the Director of Lands and Surveyor General for their safe keeping, updating and dissemination. Updated copies are sent to the NLTB and NLFC or other government agencies when required. Land parcels, whether in Native, State or Freehold land, are surveyed in the field and survey plans are submitted to the Department of Lands and Surveys for checking in accordance with Survey Regulations and conditions of the local councils and the Town and Country Planning. This is done by the Department of Lands and Surveys. Only when a survey plan is approved as to survey, leases are registered accordingly. The legal descriptions of each parcel are recorded in the corresponding title usually in a 1:1 basis. It is possible that two or more abutting parcels belong to one person. Buildings are part of the property record which is kept by the Local Councils and the Director of Town and Country Planning. It is unfortunate that Fiji does not have a Rural Addressing System and it has been a concern to a number of Government and non-government agencies such Ministry of Health, TelecomFiji and the Fiji Electricity Authority and local banks. Street addressing system in urban areas are well defined. Textual component – includes legal description of each property parcel, lot and plan number, area, land name, district, province, owners rights, restrictions, easements, mortgages, etc. Spatial component – derived from approved survey plans that show legal boundaries and in some cases un-surveyed boundaries such as formed roads. Cadastral maps show all land parcels or lots that correspond to the registered titles with plan numbers and other attributes such as parcel area. New survey plans are charted onto the cadastral map by coordinates, thus the updating of cadastral maps is a continuous exercise. 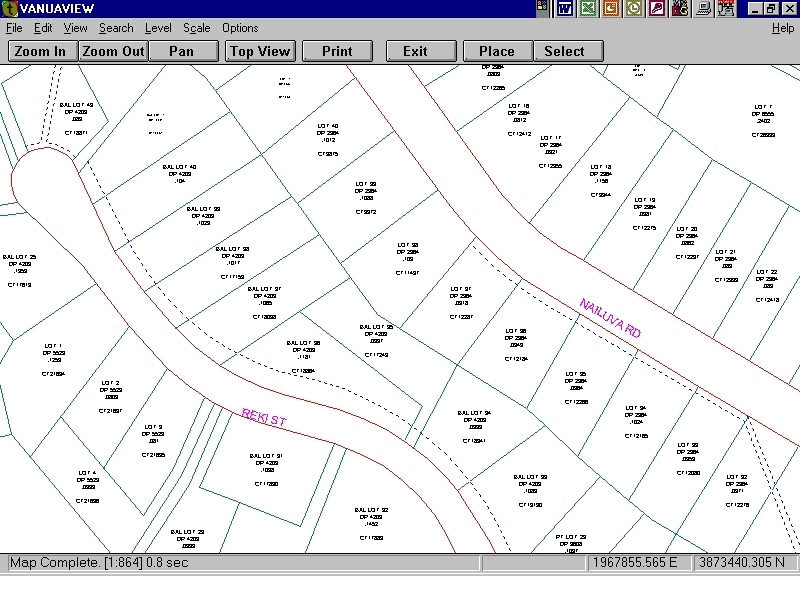 All cadastral maps have been digitized and a seamless cadastral picture is available to users. Other data/boundaries shown on cadastral maps include: local government, legal, utilities, planning, administration and land tenure (State, Native and freehold lands) boundaries. Includes un-surveyed man-made and natural features such as seawall, high-water-mark (HWM), rivers and streams. The digital dataset is called the Computerised Cadastral Mapping System (CCMS) and as at 30 June 2003, the total number of parcels in the cadastre was 91,913. The cadastre cannot be used in court to solve disputes in land boundaries but the survey plans and connected field notes. This is also true with the Native Lands Commission Maps (NLC maps) which shows Native, State and freehold land boundaries, any boundary dispute requires a proper survey to be carried out. The CCMS database would be available through the Internet in the near future. Cadastral maps are derived from approved survey plans. All cadastral map sheets of Fiji of various imperial scales of 2 chains to an inch, 8 chains to an inch and 16 chains to an inch have all been converted to digital form by hand digitizing. Outputs in metric scales of 1:1,000 (urban areas), 1:5,000 (peri-urban areas) and 1:10,000 (rural areas) are available in digital or hardcopy format. The digital base is continuously updated as new survey plans are approved as to survey and charted by using coordinates, thus improving the quality of the Computerised Cadastral Mapping System (CCMS). In addition, all CCMS parcels have been polygonised and structured to support GIS applications. CCMS updates are supplied to customers on a regular basis. The development of Spatial Data Infrastructure (SDI) has increasingly recognized the need to link land parcel attributes as the fundamental base layer underpinning the SDI model. Each CCMS parcel has a unique parcel identifier which provide the linking mechanism to other data sets such as: utilities data with Telecom Fiji, Local Councils, Roads, etc. and socio-economic data such as Census data, etc. With regards to State land management, it is critical that all State land parcels are accounted for with detail information attached. This is also true with native and freehold lands. Other datasets such as soil types, forest cover, topographic, land tenure, mineral, can easily be overlaid with CCMS for GIS analysis and evaluations. 1. The use of GPS in cadastral surveys of large areas has been an issue of contention lately, particularly in the survey of mahogany forests to facilitate leasing to the Fiji Hardwood Corporation, and the survey of Native Land Commission (NLC) boundaries. It would certainly reduce the time and cost of survey but the Department of Lands is adamant that a lot of study and work has to carried out before GPS can be introduced in cadastral surveying. 2. The Land Registration System needs to be streamlined. Currently, all cadastral survey plans are examined and approved by the Surveyor General who resides in the Department of Lands and Survey, whilst the registration of Titles and all Dealings is the responsibility of the Registrar of Titles who resides in the Ministry of Justice. The process is cumbersome and frustrating, and there is a definite need to combine these two operations and bring them under one roof and under one authority. 3. The lack of qualified conveyancing staff which affects the documentation process. There is a need for training in this area. 4. The acute shortage of registered surveyors to carry out cadastral surveys. Most, if not all, of the practicing surveyors are over the age of 40 and some approaching retirement age. Young energetic surveyors are urgently needed now, and therefore training is of vital importance.